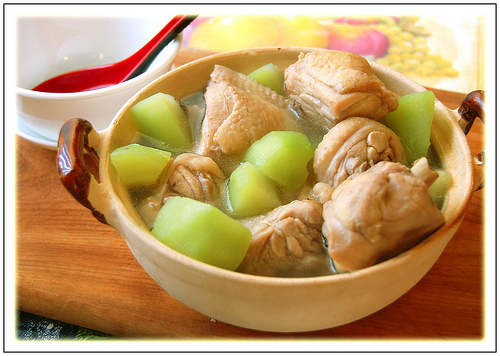 Chicken tinola is an authentic Filipino main dish and best complimented with green papaya wedges (an alternative is chayote) and chili pepper leaves. As a traditional dish, the chicken is usually cooked in low heat for quite some time to bring out the natural flavor. This dish is best served during cold and rainy weather because of the warming effect of the soup. This soothing and delicious chicken and ginger soup was popularized in the novel Noli Me Tangere by Jose P. Rizal, the Philippines’ founding father and national hero. 1 Heat the oil in a pot and stir-fry the garlic until golden brown. Add the onion and ginger, and stir-fry until the onion is translucent. 2 Add the chicken pieces and stir-fry over medium heat until partially cooked, about 3 minutes. Then season with the fish sauce and pepper. 3 Add the water and simmer, covered, over medium heat until the chicken is tender, about 30 minutes. 4 Add the papaya, chayote or zucchini and cook until tender, about 10 minutes. Turn off the heat and add the spinach or watercress. 5 Mix well until the vegetables are wilted. Serve immediately with rice.